The Leaving of a Lady. A Late Series Three in it’s natural Habitat. Icon is a grossly overused word nowadays, anybody or anything that has suffered fifteen minutes of fame tends to lumbered with the label, but there are a few things in life that it is worth reserving for and one of those must surely be the Land Rover. When I say Land Rover I’m not talking about the jazz boxes of fancy finery which adorn the streets of the more select towns and cities nowadays. No, not those, they are merely living off the fat of a distinguished legacy of the proper Land Rovers, those old crates of noise and discomfort upon which that legacy was built, the ladder framed hulks that played such a big part in opening up the world and provided a new form of mobility to those who’s work took them beyond the comfort of tarmac. These are the true heroines that carried the badge with pride and as we approach the end of January we also approach the end of this particular lady’s lineage. This month sees the last of the Defenders role off the assembly line at Solihull, production is to cease and the only hint of a replacement is an old style Discovery look alike that was trailed as a concept vehicle a while ago. It’s not difficult to understand why this particular good thing must come to an end, it was, after all, designed in the 1940’s and although it had undergone several major upgrades it was still the same old Landie underneath, a simple steel chassis with flat aluminum panels for bodywork and a driving position that was only slightly roomier than your luggage allowance on Ryanair. I’ve had four of them and loved and hated them in equal measure, around forty years separated the build date of the first from that of last and apart from a few extra wads of plastic around the dashboard and an extra gear you’d be hard pressed to tell the difference when driving. 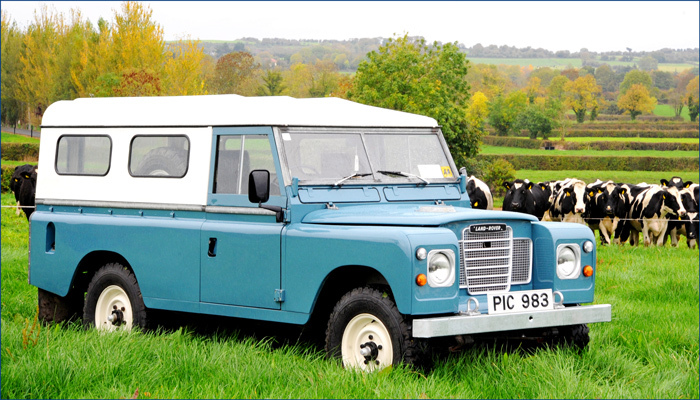 I later had a Discovery and although it was a different animal altogether there was no disguising the fact that it was still a Land Rover, for it shared that chassis, alloy bodywork and the feeling of Land Roverness which is hard to define but you’ll know it when you feel it. But it’s not all milk and honey. Anybody who knew their Landies would confide that if you wanted to get a tough job done then you needed a Land Rover, but if you wanted to do it twice, and in a bit of comfort, then best buy something Japanese, they were not the most reliable of vehicles and as for the longevity of the chassis then you may be lucky and get one that is intact but time could soon bestow a colander affect on them, especially the early Series Threes. The engines were never the most powerful or dependable either. Mind you, they were thumpers with bags or torque in reserve and would keep chugging away rather than stall, which is just what you need from a working rather than competition or leisure machine. The reliability issues were more a case of poor manufacture during the dark days of British Leyland and were hardly exclusive to the marque, so they may be forgiven for that if your heart is really sold on having one. And plenty of hearts are, for there is now a whole industry ready to take care of the aging fleet as they refuse to give up the ghost as the decades pass. After nearly seventy years the old girls age could no longer be hidden. The ubiquitous 4WD pick has assumed the role of farmers transport and off road utility vehicle, the world has been explored and roads made where there none before. The army, that other great customer, needed something bigger and stronger to keep up with modern warfare and so the demand has declined and the expense of her production increased in comparison to her rivals as the method of assembly is hardly amenable to automation. Maybe she’ll surface again one day, a licence to make them might be sold to India or China just as it was to Spain in the past. Perhaps, with cheaper labour she might have a future but is it really possible for any vehicle to continue for ever? It is unlikely, so now is the time to mark her passing and thank her for all those moments of wonder and frustration she provided over the years as well as salute the achievements she made possible and the service she has given around the globe since 1948. The Land Rover truly is an Icon. This entry was posted in Uncategorized on January 23, 2016 by Triplemanr. On Storm Alert with the Irish Red Cross. 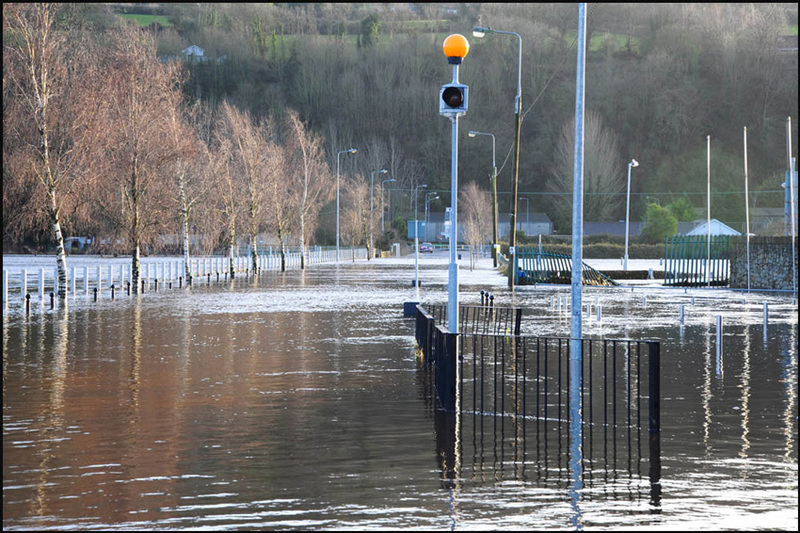 This winter Ireland has experienced a succession of storms which have produced new rainfall records and left thousands of homes damaged and lives wrecked as swollen rivers burst their banks and the cold silty water washed through homes and businesses throughout the country. This is the River Suir at Clonmel, Co Tipperary. In fact, to be quite truthful it isn’t. The photo was taken from the bridge that normally crosses the river, but it now stands merely to suggest where the river should be. 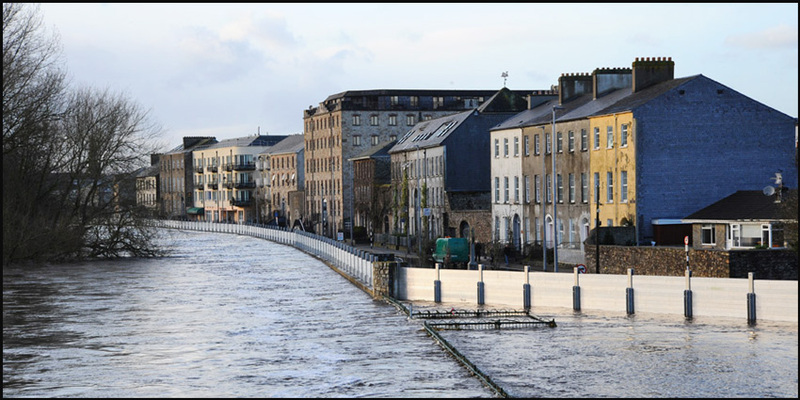 Flood defences can be effective and the €40m spent protecting the town of Clonmel appear to be working as the river Suir sweeps past The Quays on the southern side of the town. The local council has the responsibility of erecting them whenever a flood is forecast and they take many man hours of putting together, yet the council staff worked long into the night to ensure the town was saved; so far! The river level is around five feet above the street where the green van is parked. The crisis has brought the local community together with businesses offering goods and services to help the beleaguered who are caught in flooded houses or left homeless until the water subsides and they can return to what is left of their lives. 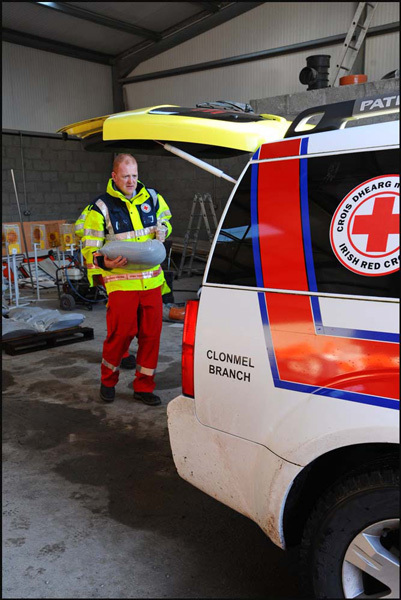 The Irish Red Cross have moved swiftly into action with the their Community Resilience programme, identifying and checking upon all those that are most vulnerable to the storms, and it is not always obvious who it may be. 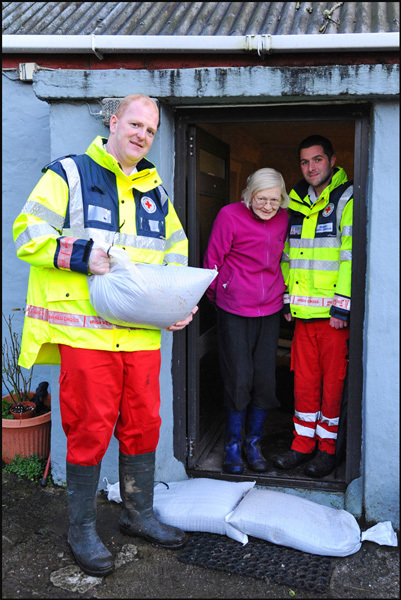 Here, Darren Ryan of the Clonmel branch loads sandbags into their 4X4 which are to be taken to the house of an elderly lady in the area. The bags had been filled that morning by volunteers from Cahir, a neighboring town a few miles upstream. 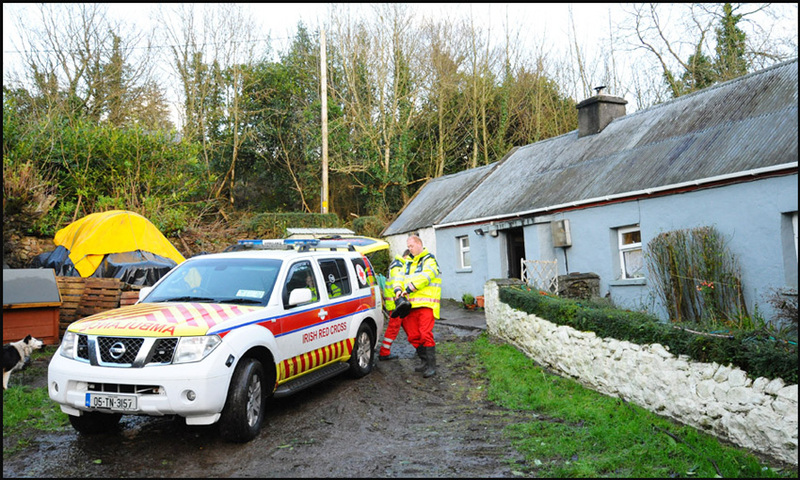 The affected house lay high in the hills near Clonmel. An unlikely place to be affected by floods but during the previous day a spring had opened up in the kitchen threatening to soak the rest of the house as it sought an exit. Grace, now in her seventies, had spent the whole of the night with a bucket and mop clearing it away before a neighbour had found some sandbags, but hardly enough to contain the flow. Darren and his colleague, Brian Lafford, had brought some more in the hope of sealing the floor above the source. Brian arranges the bags in a tight pack around the stove where the water was entering the old building. Grace was born and raised in this house and lives happily here with close neighbours, although it is several miles to the nearest shop. In the past she has survived a lightning strike which shocked her speechless for several days and hopes to return to breeding ponies now that she is over an illness that laid her low for a while. A remarkable lady who retains her independence, a fact greatly respected by the Red Cross who aim to support all in the community in their own homes rather than dictate how they should live. Having completed the job and leaving a few sandbags spare should they be needed Grace insisted on making tea and offering cake before we left. Despite the lack of sleep and her advancing years she remained cheerful and resolute that this minor drama would not deter her from her continuing to live where she belongs. “I don’t think God wants me yet” she pointed out and her simple faith in life can be a lesson to us all. Having ensured that she had food and milk enough for the new year Darren and Brian said farewell with strict instructions that she should call again if she needed help in any way. 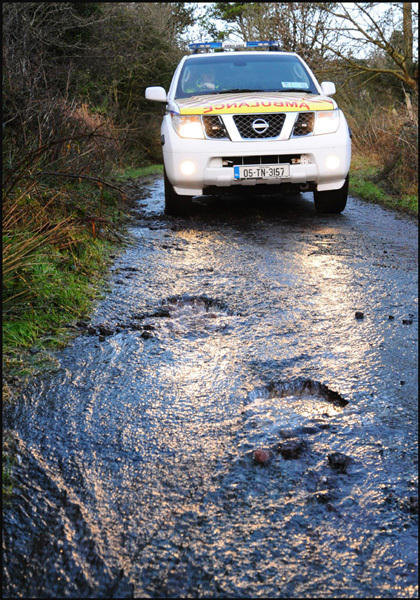 Keeping a fleet of vehicles on the road is a huge expense and a having a 4X4 may seem an unnecessary luxury for a charitable organisation, yet they prove their worth and no more than during these storms when the roads and lanes are awash with debris and the surfaces are littered with potholes. Getting half a tonne of sandbags up to Grace would have been beyond most vans in such conditions and so the ‘jeeps’ earn their keep despite their cost. Clonmel are presently raising funds for a new ambulance for which they need €80,000, money they need to find from the community, but it will not be wasted. Dusk was settling in when we returned to the town. Much of the organisation’s work is done in the evening when the volunteers are home from their jobs. Darren and Brian took a detour to check out the flood defences along the Quay before heading home. 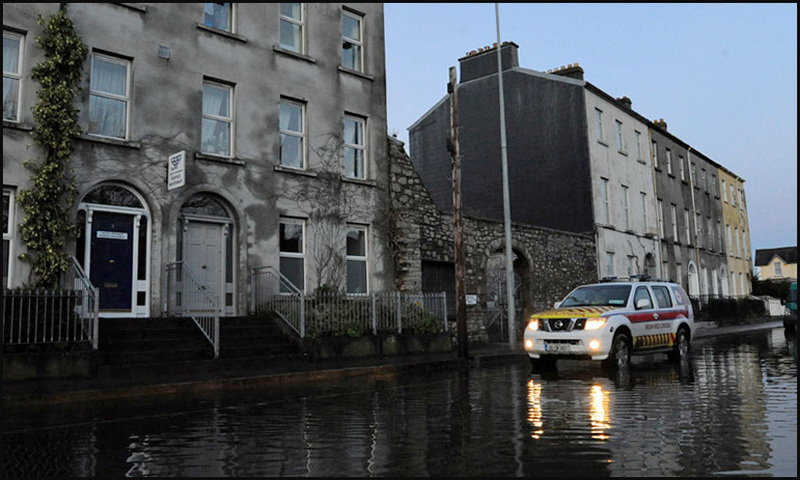 This is the street we see in the second photo and if it were not for the barriers then the water would be level with the vehicle’s roof rather than just a few inches up the tyres. Despite this apparent success there are many houses who remained unprotected so when the water leaves the real job of clearing up begins. 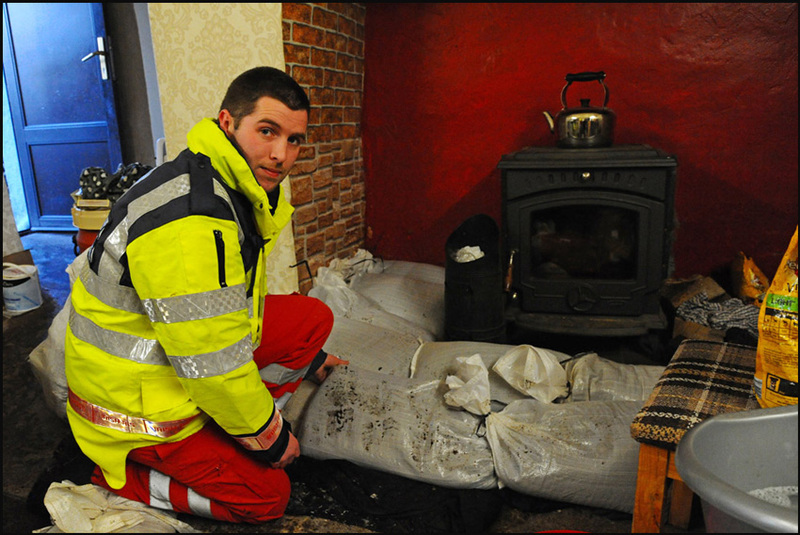 Once again the Irish Red Cross will be in the thick of it, bringing practical aid and comfort to those whose homes are damaged and belongings are lost. This entry was posted in Uncategorized on January 1, 2016 by Triplemanr.